As the frequency of extreme storms, like the ones that recently devastated Puerto Rico and Houston, grows, battery-connected microgrids are emerging as a potentially crucial technology. Such systems could help hospitals, shelters and retail outlets become more resilient against surging waters and torrential winds compared to backup diesel generators or relying on the power grid to remain operational. For companies and investors selling and financing these battery grid systems, the rise of extreme storms could actually turn out to be a major opportunity. Potential customers could look to make energy systems more resilient before storms hit their regions, or rebuild energy services in the wake of disasters. On Thursday, Tesla CEO Elon Musk suggested that his company could rebuild Puerto Rico’s power grid with solar and batteries in the wake of the devastating storm. Tesla has already sent hundreds of its batteries to the region to help with aid relief, but this offer was on a much larger scale. 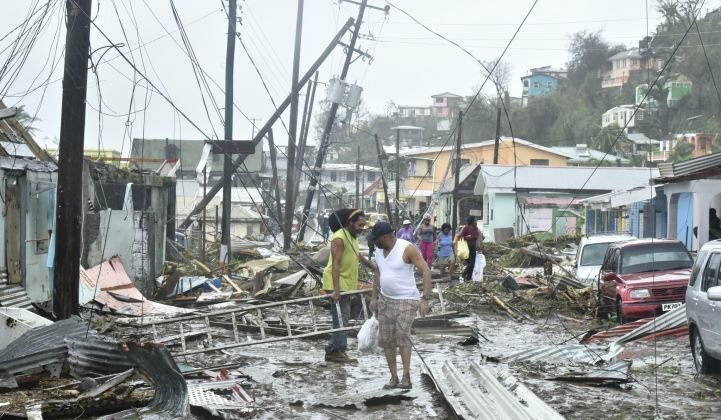 “The Tesla team has done this for many smaller islands around the world, but there is no scalability limit, so it can be done for Puerto Rico too. Such a decision would be in the hands of the PR govt, PUC, any commercial stakeholders and, most importantly, the people of PR,” tweeted Musk. The recent attention focused on distributed energy storage for storm resilience coincides with broader market trends that have this asset poised for takeoff in the years ahead. Earlier this week, analysts at Navigant Research said they expect to see 14.85 gigawatts of batteries installed and connected to microgrids globally by 2026. Those projects could generate $22.3 billion in global investment over that time period, Navigant predicts. “We’re seeing battery costs come down and microgrids connected to batteries are becoming the norm,” said Navigant’s research analyst Alex Eller. Eller said 41 percent of the microgrids that the research firm tracks are connected to energy storage. Becoming more resilient against storms is “certainly going to be a big factor” for the sales of battery-connected microgrid systems to utilities, businesses and homeowners, said Eller. Many of those projects will happen in North America and Asia over the next decade, Navigant’s report found. In remote and off-grid areas, where the grid is spotty or non-existent, customers are beginning to opt for battery-connected solar microgrids over systems with diesel generators. The dropping cost of batteries has helped make these systems a lower-cost option than the often expensive, reoccurring costs of diesel fuel. Solar-plus-storage economics on islands have already passed an inflection point compared to diesel, said former Tesla executive and SolarCity founder Lyndon Rive, during a speech in April. "It makes perfect sense to convert every island out there right now to solar and storage," he said. Backup systems reliant on diesel generators also might not be able to get back on-line if the supply chain for diesel has been crushed, noted Coleman Adams, managing director of Crescendo Power, a private equity firm that funds microgrid and distributed energy projects. “Batteries can increase an island’s ability to get back on its feet,” said Adams. Battery-connected microgrids are also increasingly financeable, he noted. “Energy storage is paramount to most of the microgrids we work on,” he said. While the technology is not as easy to finance as solar projects are, it’s getting closer. “It all started with Sandy,” said Adams. Puerto Rico has already emerged as a potential market for batteries following Hurricane Maria. Musk isn't the only one interested in selling and delivering batteries to the region. Sonnen, which makes battery storage systems for home and business owners, has been selling its technology into Puerto Rico for a year and a half, said Blake Richetta, U.S. senior vice president. But in the wake of the storm, Sonnen launched a program to build battery-connected microgrids working with solar developer Pura Energia. Join GTM for a deep dive into the budding domestic energy storage market at the U.S. Energy Storage Summit 2017. Utilities, financiers, regulators, technology innovators and storage practitioners will all come together for two full days of data-intensive presentations, analyst-led panel sessions with industry leaders, and extensive, high-level networking. Learn more here.